Comments - Terrific scene from the kabuki play commonly known as "Benten Kozo." The rogue Benten Kozo and his gang develop a complicated plot to extort money from an elderly cloth merchant. Disguised as a beauty, Benten Kozo hides a piece of fabric he brought into the shop in a stack of fabric, then makes a show out of stuffing it into his kimono. When a clerk attempts to stop her, thinking the silk stolen, a scuffle breaks out and the beauty is wounded, prompting her retainer Rikimaru to demand payment for the injury. Just as they are about to leave with the money, a samurai steps in to challenge them, although the warrior is in fact a member of the gang and is part of the ruse. Having caught a glimpse of a cherry blossom tattoo on the woman's arm, he forces her to remove her kimono, proving that she is actually a man. 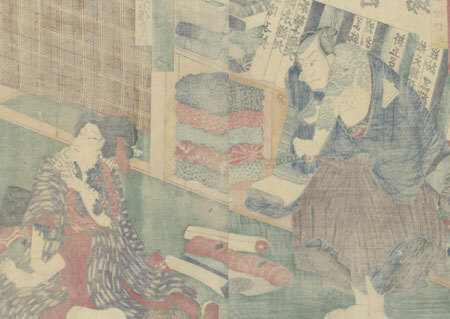 The scene here shows Benten Kozo sitting on the floor, his robe open to reveal his upper body tattoo. At left, Rikimaru scowls, his dragon and cloud tattoo visible. The shelves behind them are stacked with bolts and rolls of colorful fabric. From left, the actors are Nakamura Shikan IV and Ichimura Uzaemon. An intriguing print from this interesting play, with expressive figures and a nicely detailed setting. Image Size - 13 5/8" x 19 1/8"
Condition - This print with excellent color and detail as shown. Two separate panels. Slight paper remnants on reverse at top corners from previous mounting. A few small holes, repaired. Slight toning and soiling, a few spots. Please see photos for details. Good overall.